It came with a booklet that is a bunch of cards stuck together with brads. Wow, I don't think I've thought of brads since I was in junior high. I can't even believe I remember what they're called! Anyway, I wish I could have gotten it to stay open for a photo but it's sturdy paper and too thick to stay easily open. There's a photo and a little description of each product I received. And yes. Cash. Money. Skrilla. Dough. Clams. Cheddar. Singles. Bread. Lettuce. Phat l00t. Straight up moola to stick in your back pocket. I got ten crispy, sequential one dollar bills. I don't know how this works. Maybe it's like a pyramid scheme. Take money from the new subscribers to pay the old. Except I am a new subscriber so that doesn't make sense. But still! How do they do this?? It seems unsustainable, imo, but I'm not complaining. 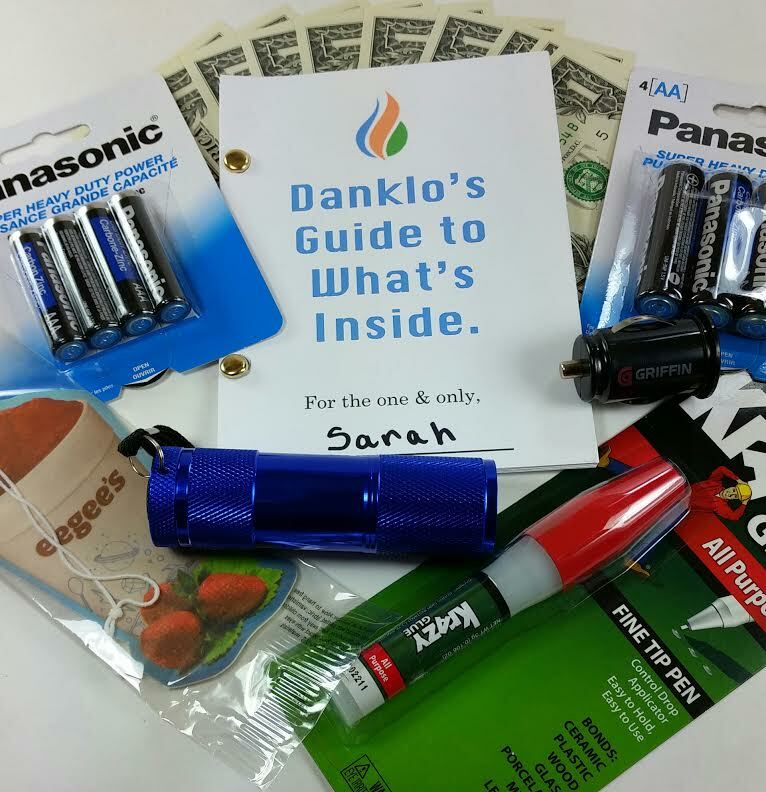 Panasonic Batteries-Danklo promises practical, useful items and batteries are definitely on that list. I got two packages of batteries. One pack of AA and one pack of AAA. 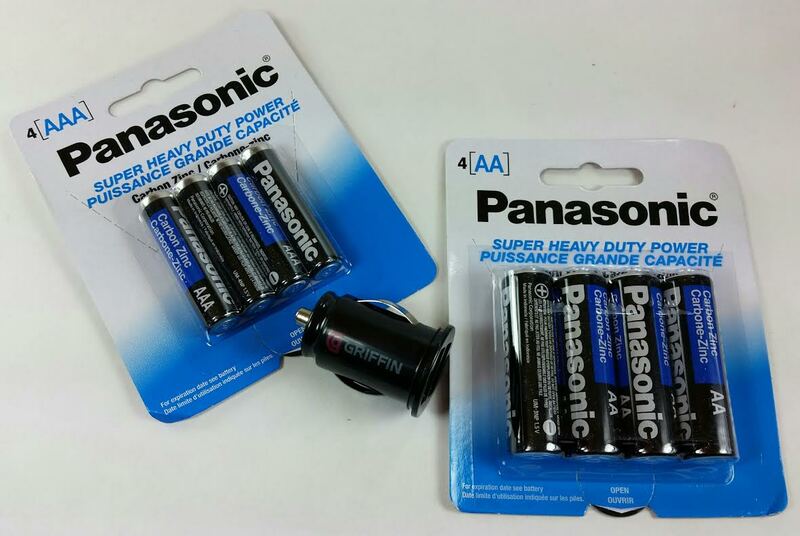 And while they are Panasonic, they are batteries and we always need batteries. Especially because it seems like we only ever have the kind that we don't need at that moment. Car USB Charger-It also has a USB car charger that fits into your cigarette lighter. I don't even know if my car has a cigarette lighter. I'll have to check. This is Griffin brand (never heard of them) and has two ports. No matter the brand it seems like it might come in handy for charging my phone in the car. Air Freshener-What is it with air fresheners lately? This is my fifth one thanks to all my geek boxes. I've no idea what eegee's is but apparently there's a place in Tucson where you can get these fruit smoothie icees. 9 LED Flashlight- I'm actually really liking the whole "practical" stuff bent. This is a small, handy flashlight that is small enough to fit pretty much anywhere. And it came with the batteries in it! It's ridiculously bright and I've already used it to help me find the dog's ball under the cabinet. 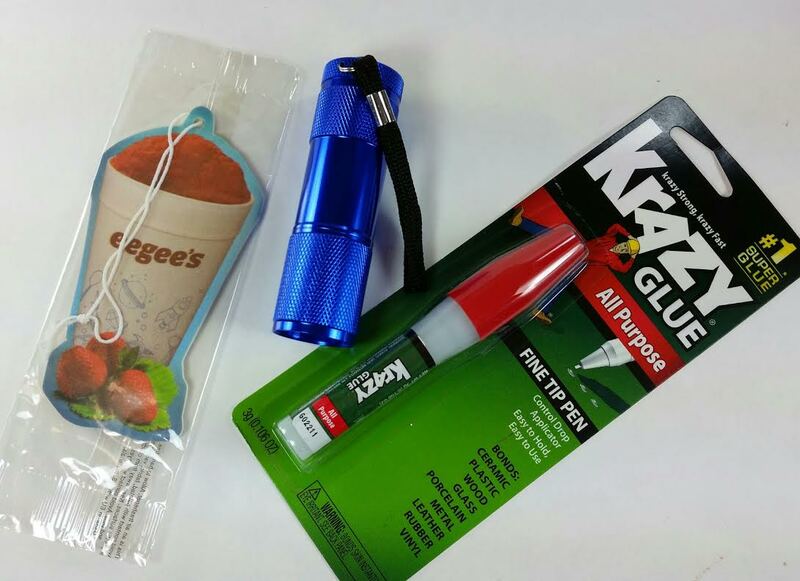 Krazy Glue- A fine tip glue pen. 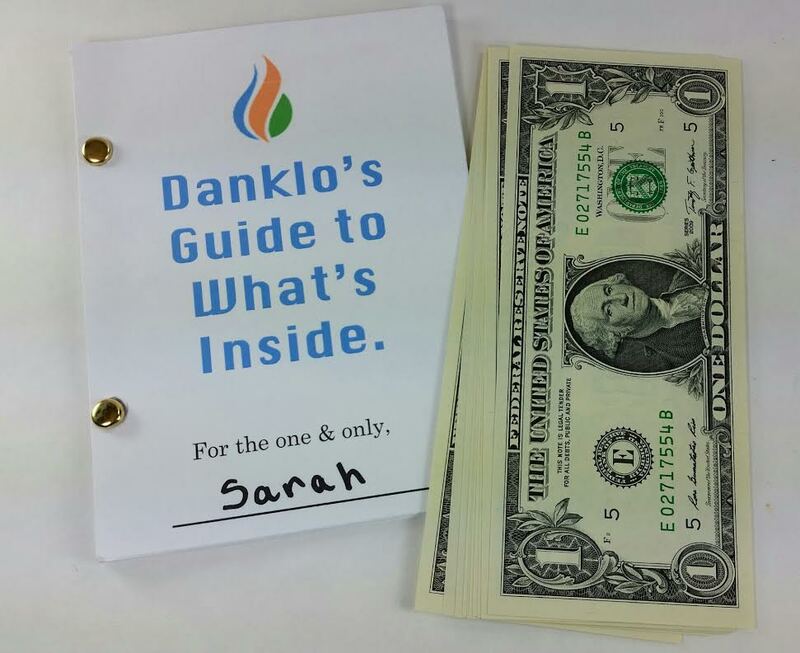 How did Danklo know that I was going to need this to make my Valentine's Day cards? They didn't, of course, but this is another practical household item. VERDICT: I can't deny that this subscription weirds me out. I mean, I got money in the mail. Ten bucks makes it so this subscription actually only cost me $7.99. Not too shabby for batteries, krazy glue and a handy flashlight! However, I must admit that I feel like these items came from a discount store bin or something. Or maybe that their selection is limited. Because after looking at other reviews, it seems like these items are the sort of thing that everyone gets, no matter how you fill out your profile. They are practical, though, and I'm happy to have these things and they will all get used sooner or later. I didn't stay subscribed but mostly because I just can't get over feeling like it's too good to be true. Use code AWESOMENESS to get 10% off your first month. What do you think about this subscription?! I subscribed! I'm curious. It's different, it's cute, and not too expensive if offset by a few bucks inside. I need batteries this very minute and did not buy when I was at the store because one pack was 10 dollars! That 10 bucks cash would cover it, and so would getting batteries in the box! However, a lighter phone charger?!? Some company is cleaning out their warehouse from the 90's. Late model cars do not have cigarette lighters unless you have them specially installed on a new purchase. It's now an "option" on most cars. Sarah, see, this is the new way to market cars - bare bones them to lower the sticker price and then add lots of options that used to be normal features. Advantage is people's cars are more customized to what they need and like (sunroof, fog lights, luggage rack, tinted windows, kids stuff in back, etc). OK, now for the other business question, how can they "afford" to give away cash? The idea here is for manufacturers to get their products promoted or introduce new items. Sort of like the beauty boxes - we buy what we try. Danklo is negotiating with scores, possibly hundreds, of companies for the items to go in these boxes. They are not buying those things at retail value. The cash is just part of the cost of the box for them and pays for itself in psuedo-suckers like us who can't resist it, adding more customers. Only one box, I assure you, will have the $1000, and that amount if you consider it part of COGS is spread over every box sold that month. Most are likely getting 1, 5, 7, 10 dollars at the most. But hey, that is still money, and I believe low enough you don't need to declare to the IRS? 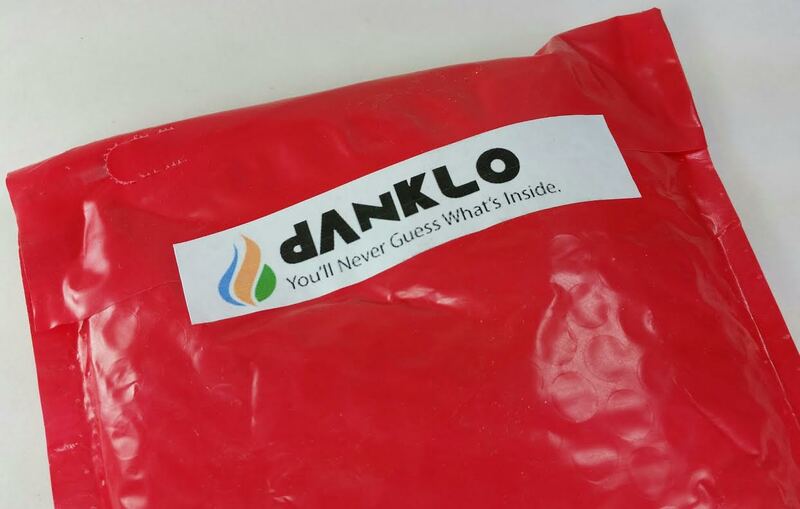 I would be curious if Danklo has to send anything like a 1099 to subscribers? Just getting money the IRS never sees brings a gleeful warming of my heart that is worth the monthly $12 for the sub box! Thanks Sarah for another great and sparkling review! While this is definitely not my normal type of subscription, I was too curious not to check it out. It seems like it would appeal to young men of a certain age but I can't deny that I enjoyed getting the batteries and the flashlight. The $10 made it interesting for sure. Im not sure of the legalities since it's sort of like a sweepstakes regarding the money. I think you may be right about the $1000, so far no one has won it. :) And I definitely think these are things somebody somewhere just wanted to get rid of. But there will always be people like me with curiosity so insatiable they just can't resist, even if it's only for a month. I did check my car and it does have a cigarette lighter but it pops out and you can put a car charger or the USB thing in it's place. In reality I'll never use it because if I haven't ever used anything like it before, I'm not likely to start. Thank you for your sweet comments! If you remember you'll have to pop by once you get your box and let me know what ended up in your box! I know! I'm just glad it was mostly useful stuff! Both the batteries and the flashlight are the kind of things that get misplaced and/or used quickly so I was totally fine getting them. I mean, it's still an odd subscription but hey, they sucked me in for a box so something is working. Maybe it's run by a secretive, philanthropic billionaire who likes to give presents to people on a large scale? Thus this was born? Either way it's both insanely weird and really awesome. Hmm, you might be on to something! The funniest thing is that I've already used the batteries and the Krazy Glue and regularly use the flashlight so it was absolutely worth it. It's just so strange!